The festive season is here and I see everyone in a mad rush to get designer clothes, beautify their homes and keep mithai and gifts ready to distribute. But none of these will matter if you feel tired and worn out on the festival days itself. All the prep-ing can bog you down, snatching away that glow from your face. How do you get it back? Steal some ‘ME’ time in all this madness and head straight to a spa. 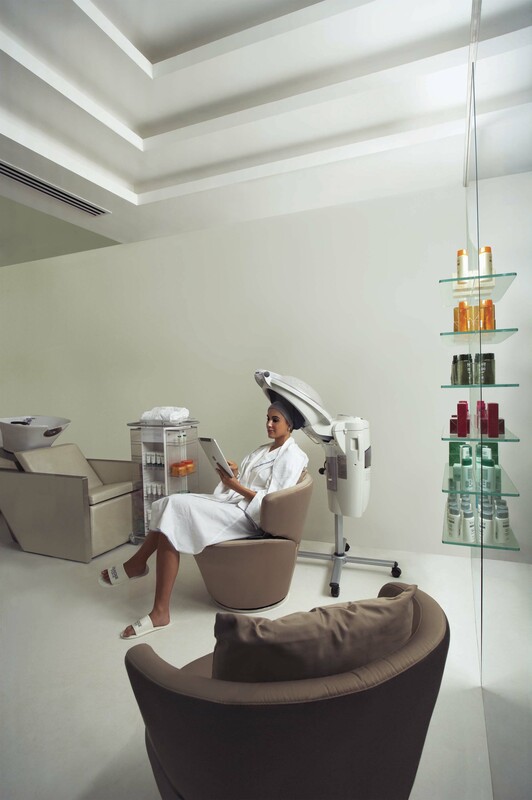 Better still, head to Saks Salon and Day Spa, which has just opened its second outlet in Andheri, Link Road. The first one is in Bandra. You’ll be surprised at how just entering a serene space like a spa can calm your tired nerves. The biggest advantage that Saks has is its gigantic space. A lavish 6,000 sq ft area, the Andheri outlet is segregated into manicures and pedicures areas, facial rooms, hair treatments and the like. The first floor is for face and body related treatments, while hair care is restricted to the ground level. The second floor is for administrative staff. Stark white interiors invite you to further calm your senses and indulge yourself. The spa and facial rooms have an attached steam room, so unlike in most other spas, you don’t have to parade around wrapped in a towel till you reach a common steam room, located in another corner of the spa! Saks also gets full marks when it comes to cleanliness and hygiene. One normally assumes that international salons follow high standards of hygiene but it is not always the case. If I had a dime for every time my friends and I saw dirty towels lying around or almost threw up seeing masseurs rinsing used mixing bowls. Saks, UK’s leading hair and beauty salon, thankfully, lives up to its reputation. The face tissues used are disposed off and the towels touching your face are warm, freshly steamed. Hygiene is a big concern with me and I avoid going to spas and salons that use cold towels and have equipment just lying around. I didn’t find myself worrying about nitty-gritties like these at Saks and that is a good sign. The menu is crisp and designed keeping in mind what men and women want out of a spa outing. There is a separate section for Kerastase Rituals, which will take care of all your hair related worries, with their volumising and purifying rituals. The 90 minute Kerastase Rituals are priced at Rs 2,500 to Rs 3,000. Next on the menu are youth specials, a variety of high performance facials and body wraps to rejuvenate tired senses. I went for the Luminous C and Sea high performance facial. Its aim is to provide absolute radiance, reduce lines and strengthen elasticity. It also provides relief for sun damaged skin, Vitamin C and freeze dried sea weed are clubbed to give a smooth complexion and luminous glow… just what I needed to sail me through Diwali festivities. The expert wasted no time in showing me to the facial room, adjusted the air-condition cooling to my comfort and started right away. A cleanse and then the faciaI, I could feel her hands swirling my cheeks, oddly in rhythm with the mellow sound of the music in the background. A 75 minute ritual, the facial lasts till the very last minute. The spa therapist told me not to wash my face till the next morning, to allow the ingredients to work their magic on my skin. I abided and to be honest, there was a visible glow on my face the next morning. I guess the technicians at Saks know what they’re doing, after all. And I’m all set for a glowing start to Diwali celebrations. 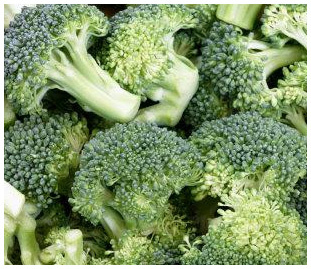 This is an easy to prepare Broccoli and Almond Soup recipe. However, the preparation may take up a bit of your time. Don’t get worked up, the end result is worth the effort. The following recipe is courtesy Chef Amit Chaudhary, CORNICHE restaurant in Bandra, Mumbai. NOTE: Any other vegetables may be added as per the requirement. remove from the flame. Once it cools, make a fine paste. cooking till it gets a colour. mixture and blend well making sure that no lumps are formed. 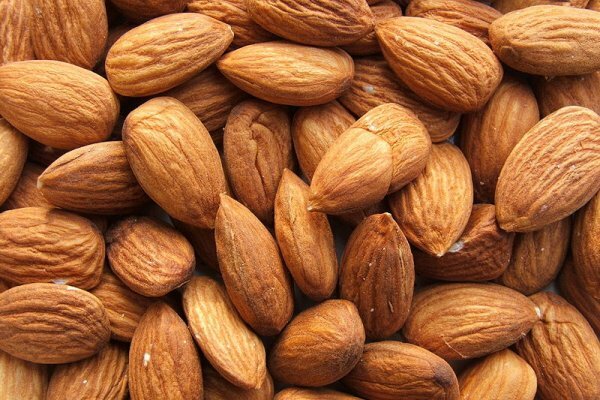 the almond paste to the mix. Add the veloute and cream and cook till the desired thickness is attained. 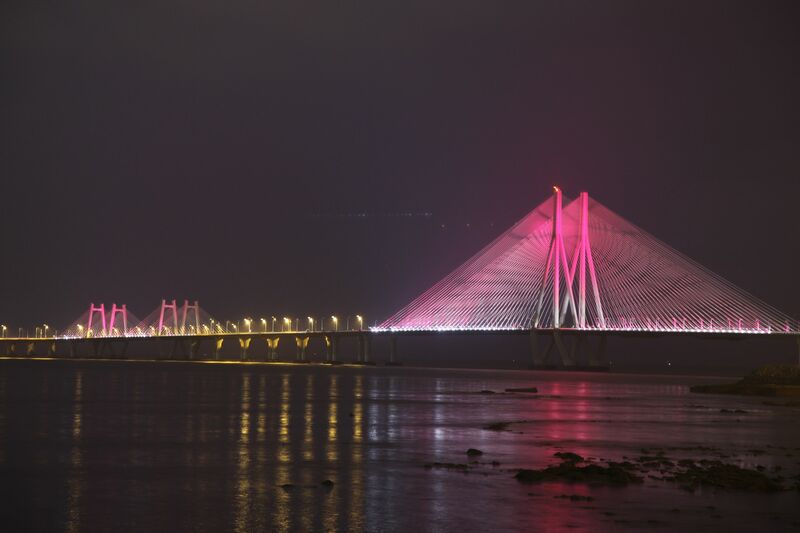 Bandra Worli Sea Link, lit up in pink to create awareness about Breast Cancer. It looks gorgeous, or what!!! Taking a cue from the Empire State Building in New York our very own Bandra Worli Sea Link, in Mumbai, will be lit pink everyday from the 5th of October to the 12th of October, 7:00 pm onwards. We have the Estee Lauder Companies Breast Cancer Awareness Campaign to thank for this initiative. Three Cheers!! !